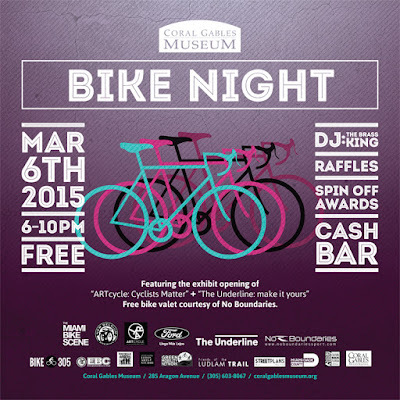 Join us Friday, March 6th at the Coral Gables Museum for the public openings of 2 exhibits that focus on local bicycle culture - ARTcycle, now in its third year, features fresh work from 30 local artists while The Underline: Make It Yours tells the story of a very important civic project to enhance the M-Path along US1 from downtown Miami to Dadeland. 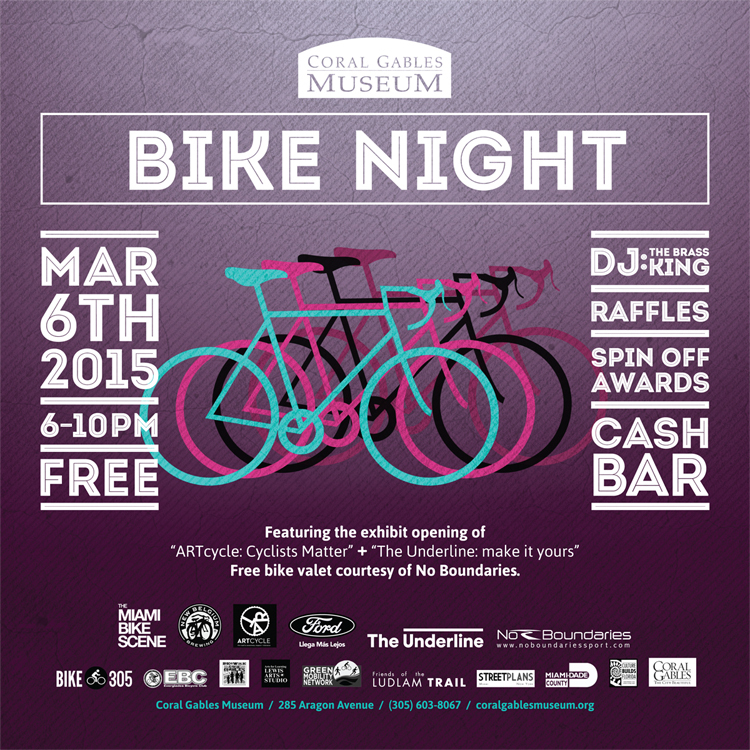 Enjoy free admission, a cash bar, bike gear raffles, ARTcycle Spin Off awards announcement, and live music by The Brass King. Ride to the museum! There will be complimentary bike valet courtesy of No Boundaries. 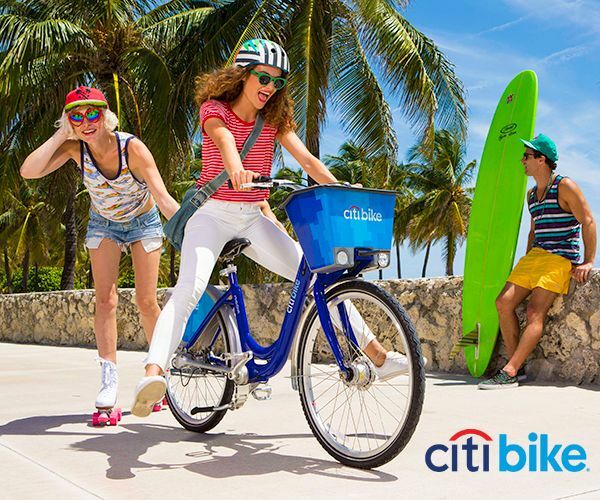 Enter through corner of Salzedo St and Giralda Ave.
*There will be a group bike ride to the Coral Gables Museum on Friday, March 6th. 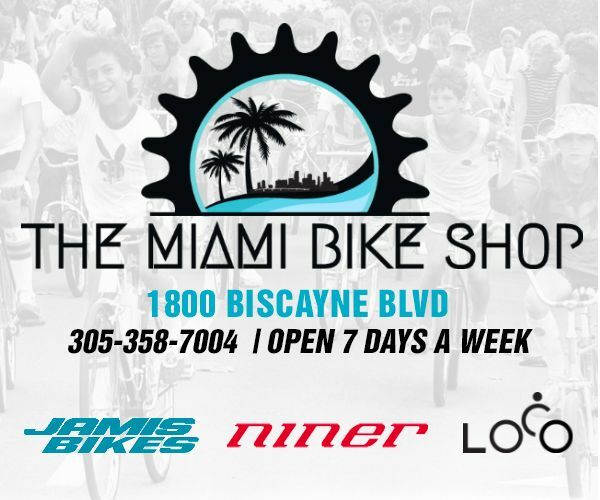 It will be departing from Downtown Miami (Government Center), meet up 6pm, pedals up 6:30pm. This will be a one-way ride. ARTcycle is an exhibit of contemporary art, both local and international, that reflects the cycling issues of today. 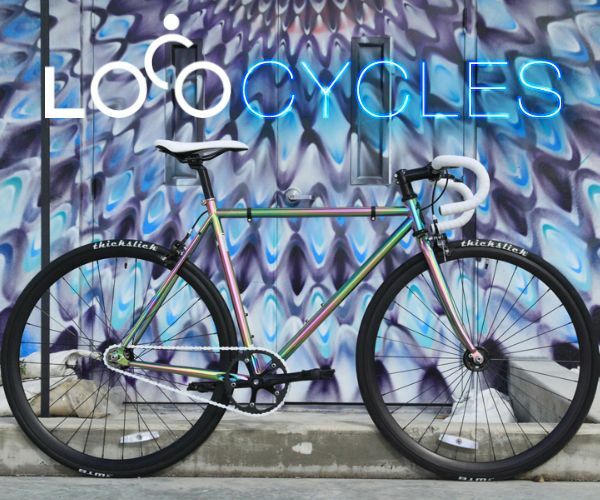 The ARTcycle 2015 theme is "cyclists matter," and the exhibit aims to bring a clear public message that bicycling culture is important to Greater Miami. People cycle for transportation, exercise and leisure activity; and cycling yields many community benefits such as less pollution, less traffic congestion, a stronger sense of community, safer streets, improved accessibility, and economic gains. It is important for cyclists and motorists to be aware of the traffic laws in order for cars and bikes to safely share the road. ARTcycle aims to promote Awareness, Respect and Tolerance of bicyclists to motorists who are not accustomed to or educated in how to share the road with cyclists. The Coral Gables Museum seeks to ensure that the viewer leaves the exhibition understanding that cycling contributes positively to communities and should be embraced as a key component of positive urban development. This year's featured artists are: H. Allen Benowitz, Martin Casuso, Mariano Costa Peuser, Clara Echavarria, Axel Font, Tessie Globe, Danilo Gonzalez, Cristina De Guillot, Lauv Grosso, Holly A. Jones, Maria Carolina Keener, Rudolf Kohn, Teje La Araña, Beju Lejobart, Carolina Molina, Janet Mueller, Anabel Peicher, Maria Esther Quintana, Edgar Ramos, Gioconda Rojas, Raquel Rub, Benjamin Saint Maxent & Adrien Blanc, Alejandra Salazar, Cesar Santaló, Aida Tejada, Jasna Tomasevic, Antonio Ugarte, Arlette Varon, Lucy Varon, and Barbara de Vries. The Underline: Make It Yours, exhibit explains the vision and progress behind the local movement to redevelop and enhance the M-Path. Friends of The Underline want to transform 10 miles of underutilized land below Miami’s Metrorail, from the Miami River just north of Brickell Station to Dadeland South Station, into an iconic linear park and world-class urban trail. The Underline will connect communities, improve pedestrian and bicyclist safety, create hundreds of acres of new green space with restored natural habitats, encourage a healthy lifestyle, provide an easily accessible place to exercise, create a mobility corridor that integrates transit, car, biking and walking, attract development along US1, and generate significant economic impact. This exhibit asks: What do you want The Underline to look like? Your input will be critical to the master planning taking place from March-June 2015. And, with your help, we can all share in the vision of this legacy project that will transform Miami into a more walkable, bikeable and sustainable city now and into the future. 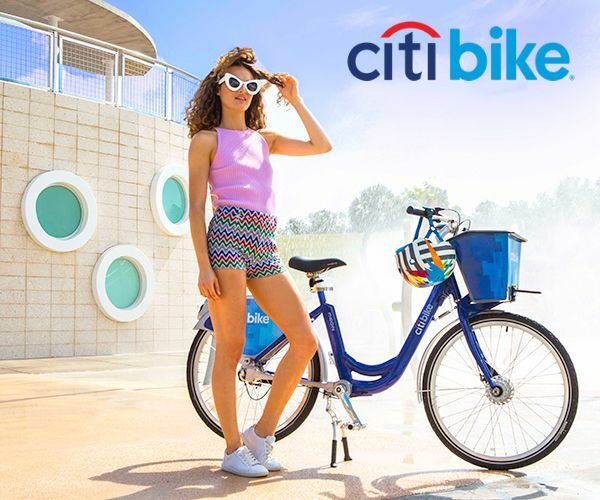 In addition to ARTcycle and “The Underline: Make It Yours,” The Museum is presenting several bike-related activities from February to May. 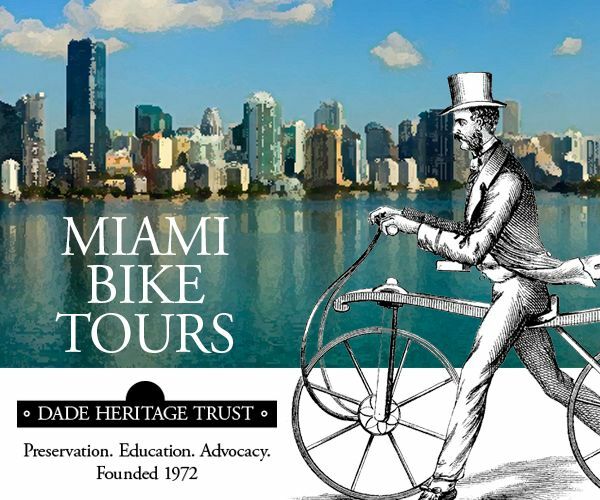 These include different bike tours, such as a February 15 bike tour of “artbikes,” a new public art installation that will be placed throughout Coral Gables from February to May; the popular Bike and BBQ event, where cyclists bike from the Museum to Matheson Hammock Park for a fun barbecue with fellow riders on March 15; and a special bike tour of Coral Gables with artist Federico Carosio on April 19. From March 23-27, 2015, the Museum will host “I Bike Coral Gables!” Spring Camp for children ages 5-12. They can bring, decorate and ride their bikes (or scooters) all week long at the Museum. Activities include bike safety and repair lessons, bike-themed exhibit tours, artist talks, bike relay races on the Museum Plaza and field trips to local parks where they can spring into action on their self-propelled vehicles.